We know that Google is pushing Google+ like no other. We also know that they are more and more focussed on person. Which means that on one side personalized search is playing a bigger role and on the other side they want to know more about us, to give us that personalized feeling. On top of that they all want us to use Google+. Now that people search is something which search engines would dive on we already predicted a few years back. Back then we thought a specific profile page would show up at the top of the results, a page you could manage. I even adviced Bing to make such a page. But Google has beaten them on it. Google+ now is that page. Today I saw something which gets very close to what I predicted a few years ago. And the center of it all is Google+. 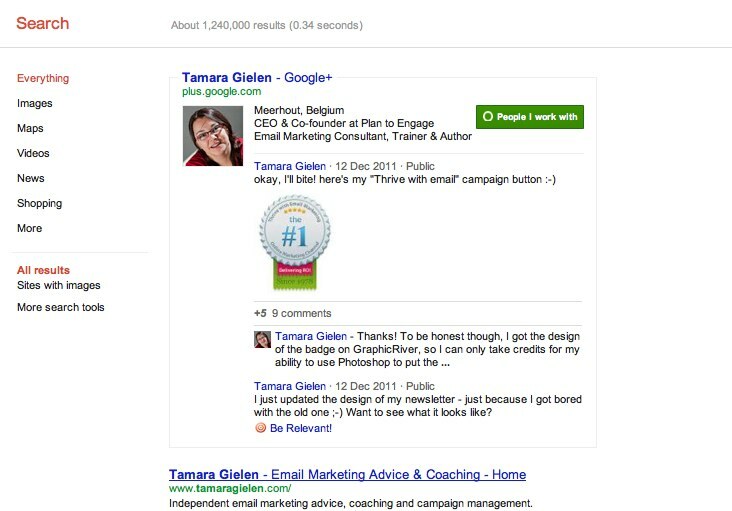 If you look at this result you will see that it is Tamara’s Google+ page which gets a prominent place in the SERPS. The most prominent place: number one. And it is not “just” the Google+ page you see. Next to the fact it has a square around it, highlighting the result, it also has the latest updates from Tamara there, as well as in what primary circle I have put her in my Google+ Circles. Note that below that result is her own homepage. 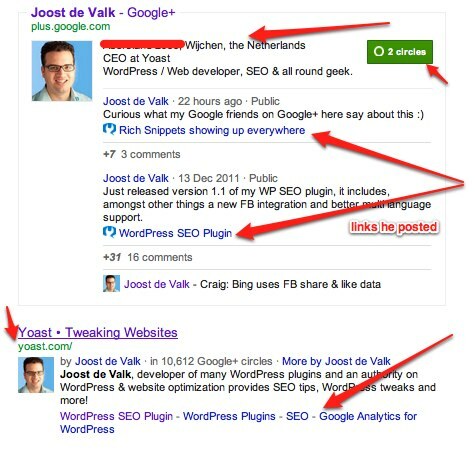 making that it will probably show up in Joost’s analytics as a link from Google, not Google+. It also shows his home adress at the top, something we noted before and is connected to the fact that I am logged in and connected to Joost. So what does this mean? A few things. It means first of all that if Google gets its way and we are all using Google+ and all have ‘circled’ everybody we will always be seeing the Google+ profile page of somebody we know on the top spot, pushing down the ‘personal’ websites of the person we are searching. Now that is not something everybody will appreciate, but it does show you should take a good look at your Google+ page. Finally, it is another indication of how Google is personalizing our experiences and at the same time is pushing Google+ immensely. I agree that Google+ profiles gain more visibility in SERP and it is very common to see one’s profile rank on the first page of search results. However, from my experience this only works for people who have limited amount of websites mentioning their name. For example, for a person with a fair amount of online publicity, the Google profile will only float between the second and third page. Google still favors older third party press and publication links if available, and ranks it over Google+. Another factor is of course how generic your name is. I am not sure if I understand you correctly. Are you saying that the more you are visible on the web, the less likely it is that your Google Profile will rank high? Because that wouldn’t make sense. Just look at the examples. 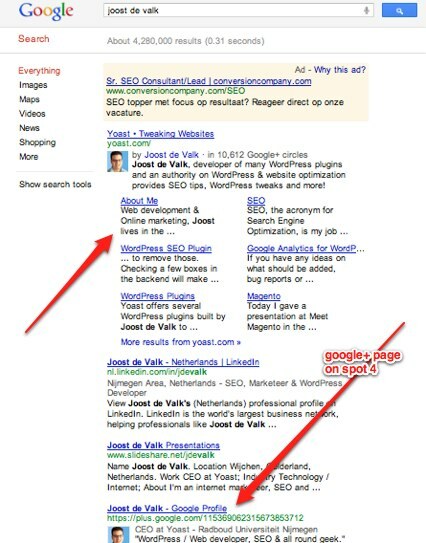 Joost gets mentioned a lot and his site is very popular, still his Plus Page ranks one. Keep in mind, this is because I have him in my circles. Try someone with several mention in influential online publications. Forbes, BusinessInsider, WSJ, etc. They will always outrank G+. But G+ ranks over other social networks and blogs. This is just my observation as I am in reputation management field and wish it wasn’t the case. That might be a reason for some to delete their G+ profile, if they’re intent on getting people to their own website instead of Google’s social thing. Yes but instead of getting people directly to your website, you’re sending them to Google+ in the hope that they will click on from there to your website. Personally, I think that’s messed up. I agree with Bas, I think Google has a tremendous amount of power to push users to it’s own properties, and you are seeing that with Google+. They are going to be a player in social even if by brute force, it’s going to work. They just announced Author Stats in GWT, and I think in 2012 we are going to see even more push toward an Author Rank as a signal in the SERPs.